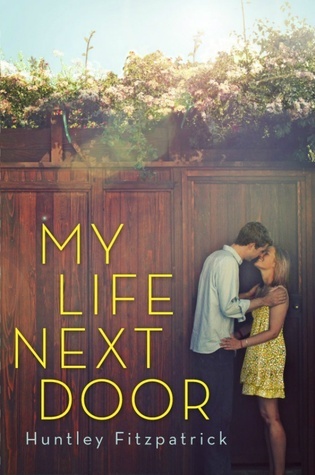 My Life Next Door is a nice, quick and summery contemporary read. At first sight it may look to be just a simple, easy romance story, it turns out to be so much more than that. Though of course, there is the romance, which is amazing and incredibly realistic. I loved the story of Samantha and Jase and I enjoyed seeing their love story play out. But the story is so much more than that. It also tackles some bigger issues like big families and prejudice, addiction, the struggle for perfection and control issues. First things first, other than the romance, I fell in love with the entire Garrett family. I felt like every single member of the family really came alive in my head. They all felt super realistic, even if the cute and adorable four-year old may have been a tad too mature for his age to be realistic. I didn’t mind because his interactions were just the cutest and funniest. I also loved how this book highlighted all the aspects of a big family, not just the good ones. Other than the Garretts, every other secondary character really stood out, though not always in a positive way. But I was super intrigued with Sam’s cold, control-freak politician mother and her slick, manipulative boyfriend Clay. Even the absent sister and the perfectionist best friend Nan will stick in my mind for a long time still. However, none more than my favorite character in the whole book: Tim. Ah, Tim. He’s an addict and pretty much has screwed up everything in his life so far, but I can’t help but root for him. I loved his humor, I loved his relationship with both Jase and Samantha and I loved his character development. Imagine my happiness when I found out there is another book focusing on Tim. I’m so getting that soon! Unfortunately, pretty much the only character in the book I could not form any connection with was our main character Samantha. I liked her ok, but she was just such a blank character. She only seemed to exist in her relationships with others. Girlfriend to the lovely Jase Garret, daughter of a control-freak mother, friend to a perfectionist and an addict. Take all those people away and I have no idea who Samantha is. I prefer my main protagonists to stand out just a bit more in the personality department and Samantha’s lack of any real personality kind of bugged me throughout the book. But overall, I highly enjoyed this book. I read it in one sitting so that’s saying something! Definitely recommend this one if you’re looking for a nice, summery contemporary that is cute and fluffy, but still tackles some big issues at the same time. I start coughing again. “Uh, No. No, George. I’m only seventeen.” As if that’s the only reason we’re not engaged. Have you read My Life next door? What did you think about it? Yes yes I have read this book and I gave the same rating to it. I too could not connect with Samantha at all! Maybe she bugged me or whatever. All of my feelings are the same as you so I don’t really have to say anything else.? Not being able to connect with a major character is always such a disappointment for me. Great review though!